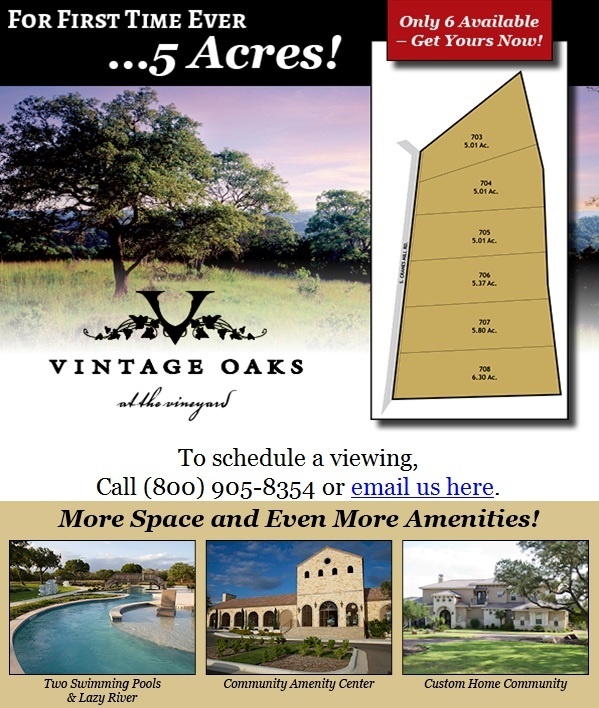 Vintage Oaks at the Vineyard has released a select number of 5-acre properties in the idyllic Texas Hill Country! This land provides plenty of wide, open space for property owners to build their dream custom home and share life on the land with family, children and even horses. These large, spacious homesites feature a rolling landscape with trees, views and privacy. 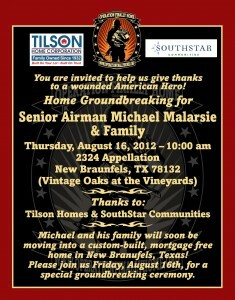 SouthStar Communities Vintage Oaks is proud to host a home groundbreaking for Senior Airman Michael Malarsie and his family this Thursday, August 16 at 10 a.m. at 2324 Appellation, New Braunfels, TX 78132. You are invited to help Vintage Oaks, Tilson Homes, and Operation Finally Home give thanks to a wonderful American Hero with a custom-built, mortgage-free home!